Skies were gray, so we went to Gruene. The fun and adorable little town of Gruene (pronounced Green) was not in our plans for last weekend’s Hill Country trip. I needed a respite from the city and some time in nature. All I wanted after two hectic weeks in the city was a long hike, and I had grand plans to hike along the Guadalupe River photographing its beautiful blue-green waters, oak forests, and fields of wildflowers. All I got was this deer. He was cute, though. Maybe another time because gray skies and rainy weather diverted us to Gruene where we wandered the streets of this unique town and into shops between drizzles. And guys, I think I found my spirit town. Gruene is such a cool town with quaint and exciting shops, vibrant restaurants, a Saturday outdoor market and the oldest dance hall in Texas. When things don’t go according to plan sometimes, you find precisely what you are looking for, and that is what I did. Gruene’s Hall. Live music and outdoor seating. Our Airstream journey is a personal one for me, and I want the décor of our little home on wheels to resemble exactly how I feel at the moment. I’ve been searching various stores since we bought it, but nothing was really fulfilling the vision that I have for it. For me it’s about vintage and nothing inspires me more than giving vintage pieces a new life in a new place. The vastness of Texas is also encouraging me to expand my horizons, so western and southwestern elements are of great importance to me in this project. With what Gruene’s shopping has to offer let’s just say I could have shopped this town the entire weekend. Oh, and I will be back. I found great vintage pieces at the Gruene Antique Company, beautiful handmade dream catchers and baskets at Natural Selections and a bright throw pillow at the Traveling Gypsy. 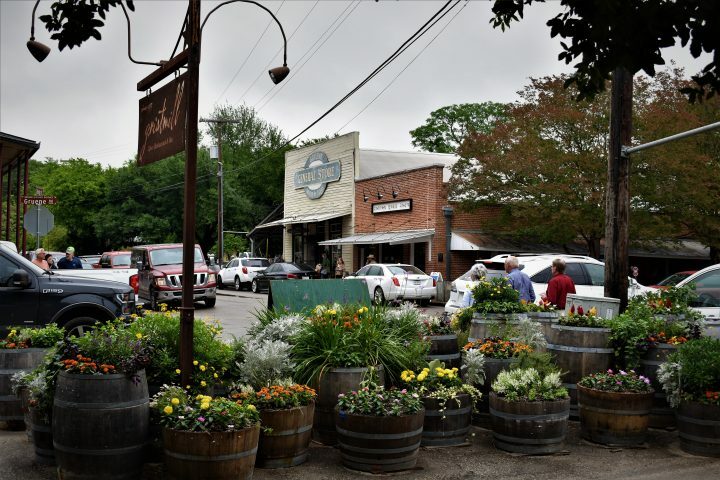 Gruene’s outdoor market is not to be missed either with vendors offering gorgeous handmade wares ranging from soaps to food, paintings to décor. Lexie is enjoying the new accents. Back at camp that evening where we were staying at Jellystone’s Hill Country Resort we settled into a nice campfire, some local pecan candies and the live music of Willie Nelson from afar as he was playing at Whitewater on the Horseshoe just up the street. Not a bad evening. The pecan candies, from the Great Texas Pecan Candy Company, by the way, were the best but I have to warn you if you buy them you will eat them all. You’ll have to take my word for it as none survived long enough to be properly photographed. So yeah, things on the road don’t always go accordingly to plan, but if you can go to Gruene, I highly recommend it. I need my own Gruene! It’s such a great place to check out and hang! They had a live band and a nice outdoor beer garden type area. WOW, how fun…I envy you all…what beautiful lasting memories you will create together! Sounds like a really nice place to visit. I enjoy reading about your adventures. You do a great job making them sound interesting. Looking forward to your next post. So close to SATX!!!! When you are close again let us know!!!! I know! I felt kind of bad because the trip was super last minute but we’ll be back soon! Anyone down to float the river this summer? 😉 me me me!